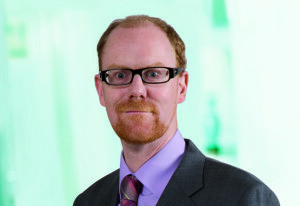 Alastair joined the Bank of England in 1994, taking over as Agent for the East Midlands Agency in February 2010. The term “Bank of England Agent” dates back to 1826, and is used to describe the Bank’s senior representative in the region. There are currently 12 regional Agents in the UK and they act as the Bank’s eyes, ears and voice in their region. Alastair leads a small team based in Nottingham from where they cover the whole of the East Midlands. The Agencies are an important channel of communication between businesses, business organisations, the general public and the Monetary Policy Committee (The MPC is responsible for setting the short-term interest rate in the UK). Alastair reports direct to the MPC and senior economists in London. Much of his time is spent visiting a wide range of businesses and talking to those at the cutting edge of the economy. Prior to his appointment as Agent, Alastair spent 15 years as an economist at the Bank’s Head Office in London. He has an MSc in Economics from the University of Glasgow and a degree in History and Economics from Oxford University. Alastair lives in Derbyshire and is married with one son. He enjoys road running and hill walking.